Villa Mayamor has a contemporary Mexican Hacienda style that is sure to please the eye and relax the mind. Most guests prefer to use the beach entrance and head right for the kitchen to see what Lydia, your maid, might be cooking up for dinner. The Kitchen which opens into the dinning room has everything you need to prepare a wonderful regional feast. You can always open up the large sliding glass doors and eat on the granite table in the courtyard that leads to the beach. After dinner, you can relax in the comfort of the living room and enjoy the warm glow emanating from the custom Mayan god motif stained glass windows or head to the roof terrace and enjoy the sunset. The master bedroom palapa terrace is also a great place to sit a while and let the evening float away. Slip back into the king size bed of the master bedroom with en-suite bathroom, sitting room and desk to plan the next day's adventure. There is a lock off beach front guest house with one king size bed and 2 single beds to accommodate the relatives with kids. For the newlyweds without kids, the jungle side guest house is the perfect hideaway with a double bed and en-suite bathroom. Both guest houses have a small kitchen with a stove and refrigerator. All the bedrooms and living areas of Villa Mayamor are air conditioned. Complimentary Wi-Fi internet and Sky satellite will keep you online and a tuned in. However, you don't come to Mexico to stay inside and watch TV. Just a few yards from the back door is the fabulous bay of Akumal Sur. The Meso-American coral reef will greet and meet the most avid snorkeler's expectations. The main town of Akumal is just 20 minutes away as you walk north on the some of the most beautiful coastline in the world. 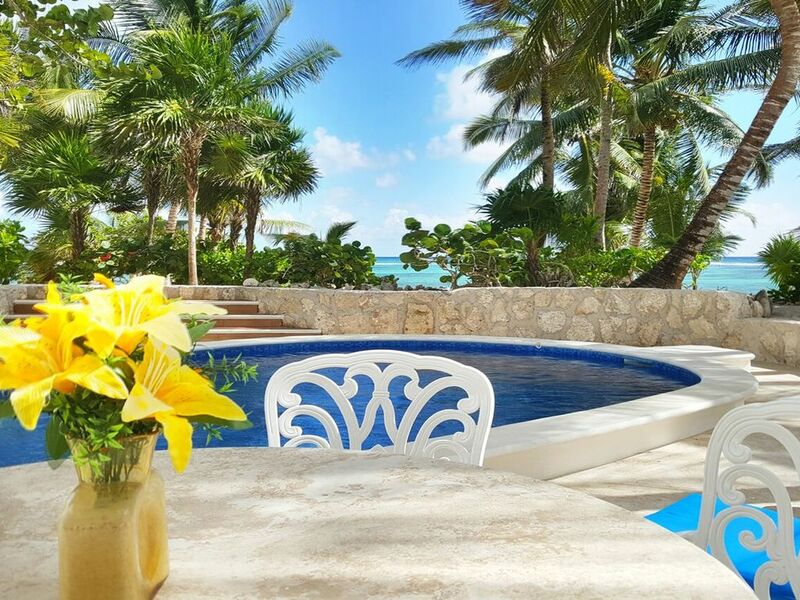 Within walking distance to Akumal 'North' where there are beach front bars and restaurants and the beautiful Akumal Bay.